I hope that you had a good holiday break, celebrating or just spending time relaxing, hopefully without pipes and heaters freezing on you because of a blizzard. Our holiday was quiet, loud, lovely and reflective all at once. Christmas wasn't anything huge or terribly fancy this year but we are lucky to have love and health, our couple and our families here and afar. It was filled with many heart warming and unexpected moments throughout the day, making it truly a wonderful time. And in my family, it's not Christmas without a batch of Truffes Au Chocolat. Really. Seeing my nieces via webcam on Christmas Eve preparing for the "reveillon" twirling in their pretty new dresses, their hair held tight by shimmering headbands was a moment as delicious as cracking the crust of creme brulees. Watching my brother, their dad, the one who used to hide in my closet to scare me at night, this proud and gentle with his daughters was a moment to savour. On Christmas day, I had a very much needed webcam moment with my mom. To prevent us from getting emotional, we had the toddler caroling for us but I know exactly what we were thinking about: my late brother and grandmother, reveillons dinners lasting until 3am, my uncles practical jokes, my grandmother's marzipan stuffed dates and making chocolate truffles. Lots of you commented how much you liked learning about other people's cultures and traditions that may be completely different or somewhat similar than your own. I'm the same way. It makes the world go round really. I visited lots of blogs these past few days and like you, enjoyed reading about others' traditions or important moments. In my family, there is no Christmas without a good dose of chocolate and chocolate truffles to be exact. Wether we make, eat or give them. Christmas preparations were always made between my grandmother and my mother around a cup of tea and a slice of cake. When I was six or so, I complained I had nothing to do, pulled out a magazine and told them I would make chocolate truffles, like the ones in the ad for Van Houten cocoa. I was actually secretely trying to find the source for the ones my grandmother's friend, Suzanne, used to make. They were so different than ours. Creamier, sweeter, richer. Every year we would go from Aix to Paris to spend Christmas with my grandparents, and a visit to Suzanne and her husband was always on the agenda. I loved their small apartment beside the bicycle shop. It always smelled as if beef Bourguignon was on the stove. We would enter, quickly marvel at the tree and impatiently wait for Suzanne to get the big silver tin filled with chocolate truffles. One for each and two for our parents. Except my parents never saw any of them. The truffles never made it this far. As years went by, many truffle recipes came between Suzanne's and me. She passed away, so did my grandmother. One day, I did find a scribbled piece of paper in my grandma's recipe box reading "Les truffes de Suzanne". My heart skipped a beat. The proportions seeemed right but there were no instructions. I know chocolate, I know truffling. "Can't be that hard" I thought. I got close but there always seemed to be something missing. I made five batches the week I found the recipe. Bill was a trooper and sampled them all, each time finding the new batch as good and decadent as the last. After he sampled the last one, I plopped next to him on the sofa and mumbled "something's missing". That's when he pointed out the obvious. They were missing: Paulette, my grandmother and her pal Suzanne. Indeed, many things had changed since that time. Life had changed us but those memories also gave us the essence of who we were now as adults. He also was quick to say that I could stop my quest for that particular truffle recipe if I wished but he hoped I didn't while rubbing his belly in a facetious way. Melt the chocolate in a large bowl set over a pot of simmering water (make sure that the bowl fits snuggly over the pot so that very little steam escapes). Stir occasionaly. Remove from the heat and add the butter, one tablespoon at a time. Stir until completely incorporated. Add the egg yolks and powdered sugar whisking until the batter is smooth. When ready to roll, scoop out balls of ganache with a spoon, roll them in between your palms fairly quickly and set them on a baking sheet. Cover loosely with a piece of plastic wrap and refrigerate overnight. 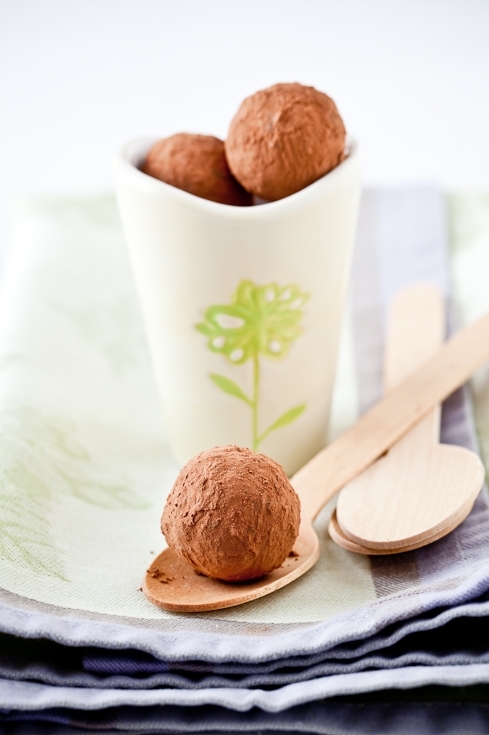 The next day, roll them in the cocoa powder and keep refrigerated until ready to eat. Yields 35 to 45 truffles, depending on size. 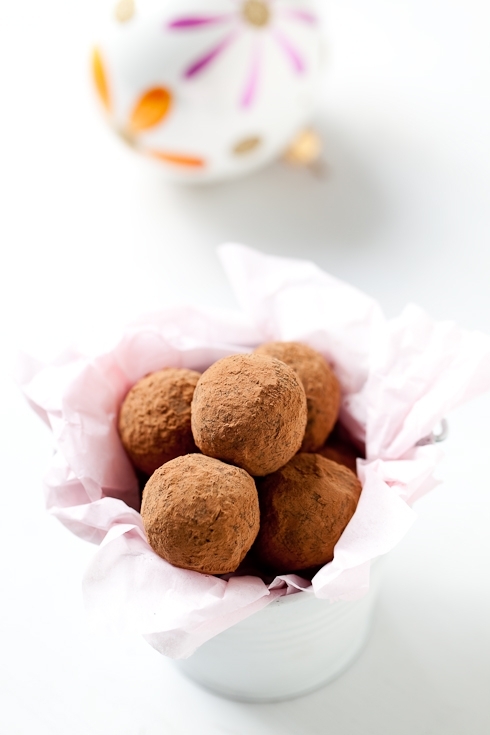 Love, love, love chocolate truffles! Now I know what I'll be cooking this afternoon :-D Thanks for sharing! this is such a beautiful, emotional & wonderful post. thank you for sharing such heartwarming & tender memories with us. may 2010 be filled with magical moments for you & your family. These look magnificent! What is the approximate yield of truffles for the recipe listed? Karen: that's a bit hard to tell as we don't always roll them the same size but you can easily get 35 to 45 truffles with this recipe. These look delicious and the photos are so gorgeous! I've never made truffles before, but these look magical and delicious. Recipes are always better when they have a great story behind them. Love your blog, just discovered it today. You are brilliantly multi talented. Looking forward to taking a closer look!! I don't think i've ever used a truffle recipe that included egg yolks...very interesting! It must add lovely richness to the truffles. So, will we be seeing a recipe for your grandmother's marzipan stuffed dates? Oh this is such a beautiful post! I can totally understand what you are going through. I've been trying to replicate my grandmother's prized lamb curry for years. But somehow, even though it turns out perfect, it's never exactly like hers. There's always something missing. I hope you find your perfect truffle recipe soon! Did you weight the yolks? I usually do since there so much difference in egg sizes... is it too crazy of me? Sil BsAs: no I don't since I always use large eggs (see recipe) which are similar to the ones we use back home. I loved reading this post Helen, memories always have the best foods tied to them, and these look like a clear winner! Very nice post. I love hearing about your stories and traditions. I hope to make these soon. Thanks for sharing a special part of your holidays. Thank you...my family [and friends] who are attending my Japanese New Year's party, thanks you for another excitingly wonderful recipe. Can not WAIT to try this. What a great story, best chocolate truffle story I've ever read. True, it's the company that is the missing ingredient a lot of times. Have fun during the rest of the Holidays! Joyeux Noël, Helen! Et merci pour toutes ces délicieuses recettes sans gluten. Quand on est si loin de notre famille les traditions nous rapprochent un peu, au moins par la pensée. Mais c'est vrai que le souvenir de ceux qui nous ont quittés rend les Fêtes difficiles. Cela fait 4 ans que ma mère est décédée et c'est le premier Noël où je n'ai pas sombré dans les larmes en suivant sa recette de la buche de Noël. Le temps adoucit la douleur... lentement. Notre rôle est de créer de nouveaux souvenirs et traditions pour les petits de la famille, comme tes nièces qui attendront chaque année avec impatience de te montrer leur réveillon par webcam. MMM Mmmmm mmmm truffles! delicious helen! I was just thinking that I was missing something this Holiday season... and when I read your post title, I realized that truffles, indeed were missing. Like you we use to make some, together with other fruits fourres, for our Christmas/New Year big family reunion and the truffles were always the first one to go. We used to add Rhum to ours... Would I need to tweak your recipe to add a drop of rhum or can I just follow it as is? Merci pour tous ces souvenirs! I find that sharing them helps with the distance, the lost loved ones; it also helps create new souvenirs! Your read my mind! Just today I was reading Alice Medrich's Bittersweet in the train and though that the first thing I'm going to make will be truffles - and here they are! A very positive sign, indeed. Hi, I am from Australia and I simply love your beautiful blog....so elegant and full of exquisite stories and recipes. In regards to the powdered sugar, in Australia we have pure icing sugar and one that is mixed with what you would call cornstarch. Is the powdered sugar you use pure or a mixture? A lovely read Helene. I don't have any Christmas food memories from my family. Hopefully that has changed with my children. They are at the age where they insist on certain foods at Christmas time. I love everything about this post! The vision of your sparkly nieces and this fabulous sentence: "Every year we would go up to Paris to spend Christmas with my grandparents." Thanks for sharing those great stories. It is wonderful to be able to share in family traditions and those truffles look divine! I don't think I've ever heard of eggs in a truffle recipe before; I'll have to give it a try. This recipe is going to the top of my "to do" list for next year. What I really want to know is where did you find those neat boxes to put them in! I realized from reading your beautiful and moving post that I felt exactly the same way. Many thanks to you and your husband for pointing this out. Sometimes the answer is so simple...we are just "missing", period. I can eat a delicious cinnamon roll every day, but if it is at Christmas, and it isn't being handed to me by my mom, then it will be lacking. And so will I..
Angela: nowadays about 99% of store bought powdered (also called icing) sugars are mixed cornstarch. It's to prevent the humidity from caking the sugar too much upon sitting on the shelves. I used Dixie crystals brand which is one of the most widely available here and it does contain some cornstarch for shelf life. You are good to go with either or, a mixed sugar or a straight powdered sugar. What a touching post. It reminds me of my own Grandmother and brings tears to my eyes. I miss her everyday. The truffles look amazing but I think whats more amazing is the memories you have and shared with us. Thank You..
Kate: the egg yolks make them even richer. Esmeralda: they are just plain white jewelry boxes that I bought at a paper supply and glued a ribbon around, put a sticker on top and tied it up with a ribbon. Beautiful truffles and wonderful post...or is it the other way around? Amazing! Your poignant writing style is beyond heartwarming! It never fails, that I leave your blog's posts reminiscing and honoring your nana, with dry eyes. I love how you captured the dark sexiness of cocoa, via contrast. Simply brilliant! Decadent looking truffles. I'd never have guessed they contained egg yolks but can see how they would add to the richness. Wishing you and yours a fabulous start to 2010. Beautiful post!! Seeing that these beauties contain eggs, how long can they keep in the refrigerator? Such wonderful holiday traditions. And how can you go wrong with holiday truffles...delicious! I hope you had a great holiday. Have a very Happy New Year too! I was just thinking about making truffles! Love your posts and gorgeous pictures! I'm going to try this recipe! Thank you!! these look fantastic! i can't wait to try the recipe. your blog is a gem - so glad i found it! happy new year. I read this post with almost a little tear in my eye. I too, each Christmas, miss my father that has now been gone way too long. And I think of friends who have lost people near and dear, too. I shook my head at the part when your husband points out 'the obvious' about what was missing with the truffle recipe. Then I smiled. Because it was wonderful to be reminded of how much love can influence us, can affect us, can impact us. Which is one of the reasons why I bake. And when I sit there and wonder what it's all for, i.e. baking, I am reminded of why. I'm sure all the wonderful things that you bake for people, are received with the same dose of love. That's one of the most powerful things in the world. Isn't it? Happy holidays to you Helen, to you and your family. Helene, what an absolutely lovely post! 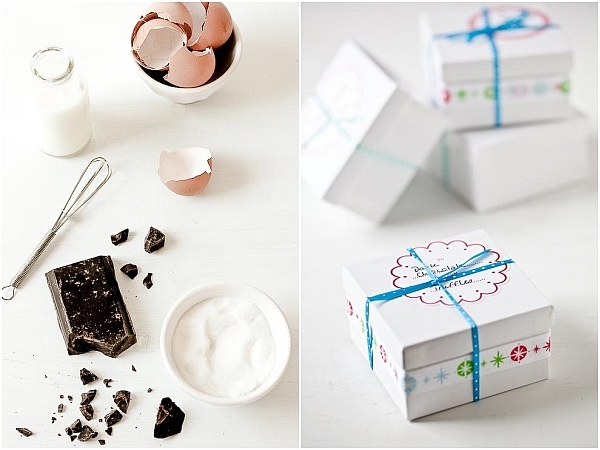 To combine truffles with such beautiful memories is so sweet! 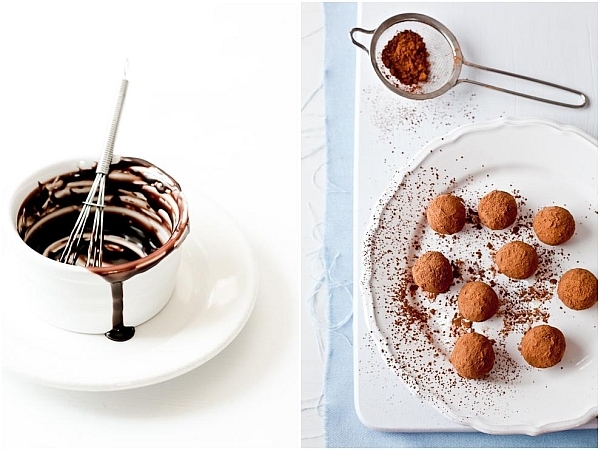 These truffles sound and look divine. I have only prepared mine with heavy cream, dark chocolate and other flavors.....never with egg yolks and butter. These must be so rich and fabulous! These look incredible, and they do sound amazingly easy to make. What is that lovely cup you have them sitting in in the first photo? Is it a mug? It's adorable! You, my dear, have a gift for story telling and putting your heart where your words are. It's truly wonderful. Hope you have a wonderfful 2010! Thanks so much. I appreciate you taking the time to reply. oh wow this is the first time I've seen truffles made with egg yolks. Does it taste different from the one made with cream and chocolate? they look so perfect and delicious!! love your blog!! Joy: they will keep for up to 5 days in the fridge without a problem. SimplePleasures: yes, and no. It's a complete different kind of richness and at the same time it's the familiar taste of chocolate truffles. I love to live through you pictures. You have inspired me to start looking for tartlette pans. Your pictures are breathless, if you're a sweet lovin person! I'm not sure how I am just discovering your blog now! How lovely, you are inspiring! Wow!! Amazing blog! I'm glad I found it :) Very very beautiful pictures and good recipes! Last day of the year i learn something new. Never knew truffles had egg yolks, that explains the creamier texture. How sweet of you to share the recipe. They look absolutely irresistible. It was around this time last year you found my little blog and wanted to stop by to wish you and yours a very bright and sweet 2010! My husband love truffles and will add this one for sure to my must tries. Kate: not all recipes for truffles contain eggs, so not all creamy truffles are not all made with eggs. I saw these and made them almost immediately. When a craving calls, you have to answer. Although, admittedly, my impatience won out and rather than chilling "overnight," I just did 30 mins in the freezer and an hour in the fridge ;) Divine! When I lived in Geneve, I made the tuffle recipe straight from the Van Houten box. Everyone loved it; they were a huge hit. I copied down the recipe and I have it still. I made it in the states several times. I gave them to my husband before we were married as a Christmas gift. He had the same opinion as many other Americans--they were too bitter. The cocoa powder on the outside was "not sweet enough" they all said; they all liked the idea of coating them with powdered sugar instead! So, it has been a long time since I have made them, as I don't want to eat the entire batch myself. Did your family bring you some lovely cocoa powder on their visit? The best for you in 2010, Helen. Storytelling is such a wonderful way of sharing yourself with others. So is chocolate! I really enjoyed this post. They're chilling in the fridge now... I'll be back later with a full report! eugenia: yes they do. I guess it was not too much a concern to my grandmother as she would get fresh eggs everyday and I do the same. I think it also has to do with the culture/generation. I made these with some cayenne pepper and a tiny bit of salt. I loove the combination of sweet chocolate with the heat off the pepper. Great recipe! Wishing You The Sweetest Of Holidays! Menu For Hope 6: Call For Prizes!